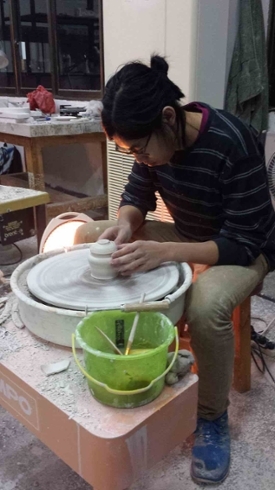 Josh Tsang, sophomore chemistry major and recipient of the Winter Fellowship for International Travel, reflects on his time in Jingdezhen, China, completing an artistic residency in Chinese ceramics. Despite being safely at home in Portland, and having almost no school or work obligations, I still feel as if I am at the mercy of the external world. 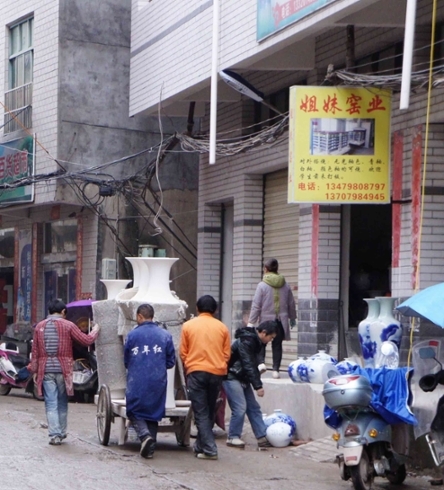 I have just completed an artistic residency at ‘The Pottery Workshop’ in Jingdezhen, China – a ‘small’ (for China) town known as the birthplace and capital of porcelain – and I have never felt so inexperienced in ceramics (not even when I first started making pottery 7 years ago). This isn’t because I haven’t learned anything or made progress in my work, but because everything I knew about how art and pottery works in North America was thrown on its head in Jingdezhen. That’s why I’ve titled this post “Learning to Let Go” because literally everything I knew, from producing work – the throwing, glazing, firing processes – to the conceptual idea of ceramic art was thrown out the window. I was starting from scratch. Heading into my residency, I had really only worked with stoneware clay in North America. Jingdezhen, however, is known exactly one type of clay: super white porcelain. 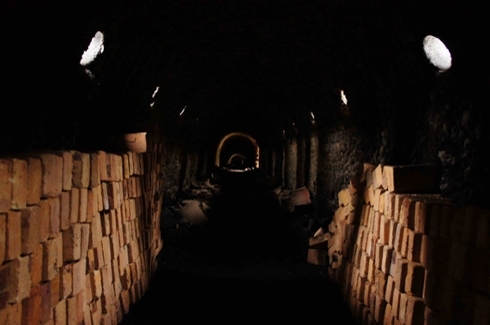 The differences between these two clays are the raw materials used to make them and the particle size of these raw materials. These differences amount to one thing: porcelain is very thixotropic compared to stoneware. In other words, porcelain acts like jelly and likes to crack and flake away, while stoneware keeps its form and is easy to work with. This difference forced me to let go of my previous techniques that I had used when working with stoneware, and challenged me to learn a completely new throwing technique. Furthermore, since I was so unused to the production process of porcelain, I ended up with pile of flopped, cracked, and generally broken pots. Compounded with the fact that making a single finished piece requires the piece passing through about 7 different hands (me, the porter to the kiln, the glazing man, the kiln loading man, the firing man, the kiln unloading man, and finally, the porter back to me), I had to learn to accept that a piece (or ten) might be lost to elements out of my control. Eventually, after roughly two weeks of producing work, I learned to let go of my anxieties and trust that if I broke a pot, I would have time to make a new one, and if someone broke a pot of mine, I would just get over my emotional heartbreak (yell at them and ask for my money back), and start making the next one. It was not only my technique and work that I had to let go of, but also my entire concept of art. Since porcelain-ware began to be manufactured in China, the process has traditionally been separated into (precisely) 72 steps. In Jingdezhen, a different person does every single one of these 72 steps. This means that if you have an idea for a piece, you don’t really have to do anything except tell people what that idea is, and it will get done. As a North-American-trained artist, this idea is completely foreign. I was taught to believe that if I don’t do everything from mixing my raw materials, to firing my own kiln, I am not really an ‘artist’. Additionally, since most of Jingdezhen’s ceramics is mass produced, casting (and not throwing) is the main method of producing functional ware. In high school (where I learned about ceramics), my peers and teachers had a strong bias towards throwing – which I inherited – and constantly inferred that casting was an inferior and less artistic form of production. However, after meeting one of my favourite ceramicists, Takeshi Yasuda – who was working innovatively with slip-casting – and a talented and creative slip caster who was also a resident at The Pottery Workshop, AND seeing the amazing effects that can only be done with casting, I’ve let go of my somewhat discriminatory attitude towards casting and have embraced it as another incredible form of ceramics. Whenever I leave somewhere I’ve visited, I always experience pangs of anxiety that start along the drive to the airport, that increase in intensity as I take off, that peak as I watch one of my homes shrink and fall away in the small, airplane window and that very slowly fade as I begin to fall asleep on the plane. I think it’s usually a mix of nostalgic memories from the trip coupled with a sense of worry that I’ll never be able to experience what happened over the past days again. This trip was no exception. In fact, the anxiety of leaving was probably compounded with the paradoxical threat of being trapped in Jingdezhen by a snowstorm. Again, learning to let go of my previously arranged travel plans! However, no matter how much stress a rogue, once-in-a-century snowstorm could induce, I can easy my departure anxiety by knowing that I will go back to Jingdezhen. I had such an amazing experience, as an artist, a student and a traveller, and I just feel that so much more was left undiscovered by my first trip to Jingdezhen. I suppose that all I can do now is let go and hope the world allows me another chance to visit that magical, ceramic paradise. Explorations, encouragements, and extraordinary experiences of Reed students, alumni, parents, and friends.